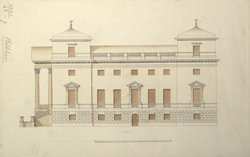 The construction of Holkham Hall, one of Norfolk's most famous stately homes, began in 1734. It was designed by its owner Thomas Coke, the Earl of Leicester, with his friends Lord Burlington and William Kent, all of whom shared an admiration for Palladian architecture. Coke then employed the architect Matthew Brettingham to oversee the interpretation and implementation of the design. The house was finally finished in 1764, five years after Coke had died. The plan is based on the Villa Mocenigo, near Venice. This view shows the south-front portico jutting out, and one of the four angled pavilions that surround the building. The state rooms are on the main floor, in keeping with Palladian style.